You are currently browsing articles tagged Little Thatch. September has come around again and so has the Royal County of Berkshire Show. 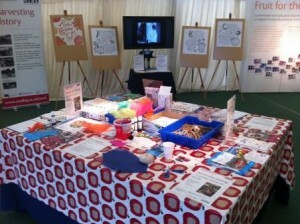 I spent this Saturday helping out on the University of Reading’s stand, where this year’s theme was fruit. There were Berkshire varieties of apples on display, single-variety apple juices to sample, old films from the MAFF Advisory films service about pruning fruit trees and storing apples to watch, a ‘bumble-arium’ with live bees buzzing around and a bee-expert on hand to answer all the bee-related questions, and fun activities including making a bee hotel (or should that be a Bee & Bee ? ), making a fruity fizzy drink and pedalling your own smoothie on the smoothie bike. The stand was really popular and did really well again – winning two first prizes at the Show. Having just catalogued the thatching collections at MERL (we’ve got about 200 thatching objects, mostly tools), I’ve developed a bit of an interest in thatch. There were two Master Thatchers at the Show, and I managed to have a quick chat with both of them. One, Jack Challis of Little Thatch, specialises in scaling down the thatched roof for smaller structures such as garden sheds, dog kennels and even bird boxes – a great way to experience thatch if you don’t live in a thatched house! 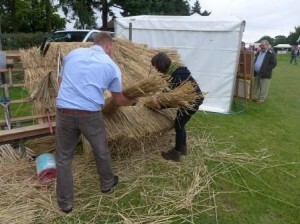 The other, Ben Fowler of Fowler & Sons Master Thatchers, let me have a quick go at thatching their display roof… not sure I was quite up to scratch but definitely the highlight of my day! 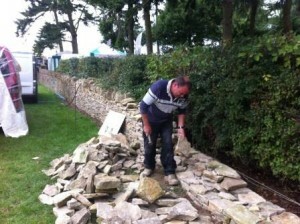 I also met a Cotswolds dry stone waller. What differentiates Cotswolds dry stone walling from that in the north of England is the shape of the stones used – they tend to be much flatter and squarer, giving the wall a distinct stratified appearance. Mark Roberts has been building the wall at the Newbury Showground for the past fifteen years or so – he only works on it for the two days of the Show each year but it continues to grow and most be over 100m by now. The Cotswolds dry stone wall at Newbury Showground grows by just a few metres every year. There was also a coracle maker – Peter Faulkner – who specialises in making coracles with a skin/hide covering. I find there’s a certain romanticism attached to the coracle and I’ve long been tempted by a coracle-making course at the Weald and Download Museum, but am yet to go on one. We do have two here at MERL (one of which we’ll be getting out for the pop-up exhibition on Friday 8 November) but ours are very different from Peter’s. We were also keeping an eye out for apple presses for MERL’s Apple Day on Saturday 19 October, so were alert to all things apple. We came across a really interesting stand called My Apple Juice. I hate waste, especially wasting food, and was told that 90% of apples in private gardens go to waste – I was shocked! Richard Paget, who runs My Apple Juice, wants to recreate the Italian village olive press and have one communal apple press every twenty miles to address the issue of waste. He runs a service where you can take your apples and have them pressed, bottled and pasteurised, and even labelled with your own ‘brand’… MERL apple juice anyone? So all in all, a fun day out with lots to think about!